This page provides details for the options available and information to help choose the best solution. The switchover process starts on the 8th April 2009, commencing with the Beacon Hill transmitter which serves Torbay. What domestic equipment is affected? What alternative services are available? How much does new digital equipment cost? What digital programmes are available? What other future changes need to be considered? Any equipment that uses an analogue TV tuner will be unable to receive TV programmes directly after the switchover. New TV sets and "digital ready" TV sets typically include both an analogue and a digital tuner, but many conventional TV sets currently have only an analogue tuner. VCRs also have an analogue tuner, so they can record a different programme to the one being watched on the TV (a key requirement for recording TV programmes). The simplest option for an existing analogue TV (particularly if it still has some useful service life) is to provide some form of digital receiver that connects to the TV using e.g. a SCART socket at the back of the TV set. This effectively makes the TV set a "monitor" for the digital receiver, and all programme selection is made using the digital receiver's remote control. For VCRs, the situation is slightly more complex. Although a VCR can record a program from a digital receiver (using e.g. the SCART socket), it will only record the same programme that's being viewed on the TV set. The ability to record a different digital programme requires a second independent digital receiver. Adding a second digital receiver is an option for this, but this can be confusing; requiring setting one receiver specifically for the VCR and the other to watch something different on TV (as well as the proliferation of remote controls). A better option for recording digital programmes is to buy a dedicated twin tuner recorder (typically referred to as a PVR - personal video recorder or a DVR - digital video recorder). These are available for Freeview, Satellite and Cable TV, but are functionally different to a VCR - once the menu system and operation becomes familiar, they are quite easy to use. Freeview uses the existing TV transmission network, but replaces one analogue channel with a digital multiplex (MUX), which may contain up to eight or nine digital TV programmes. The existing analogue transmission system has significant limitations in place to maintain picture quality. As a consequence, Channel 5 could not be introduced at every transmitter site in the UK (including Beacon Hill). These restrictions are much less severe for digital transmission, which allows more channels to be transmitted in the same bandwidth. This has given the opportunity to dramatically increase the number of TV programmes available on terrestrial TV, and free up some of the existing TV frequency spectrum in addition. The disadvantage is that everyone has to "go digital", which requires some domestic equipment changes. Existing Sky customers will be completely unaffected by the digital switchover - they have in effect already made the "switch" to digital. Cable TV viewers are similarly unaffected. Which services are available? Some options may not be available in a given location. Equipment and subscription costs for particular services? Freeview receivers cost less than satellite receivers and don't require a subscription. Programme selection and viewers' requirements? Sky premium programmes aren't available on other platforms. In the example screenshot above, all of the digital TV options are shown - Freeview, Satellite (Freesat, Freesat from Sky & Sky) and Cable (Virgin Media & BT Vision). BT Vision combines a Freeview receiver with an internet TV capability - see the section on Cable TV for more details. N.B. 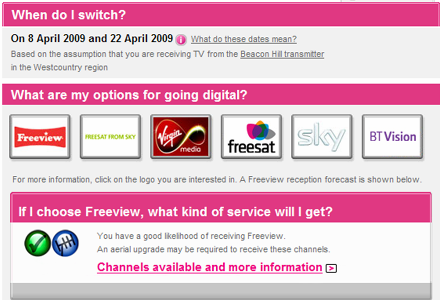 The Freeview service is not the same from all transmitters. Main transmitters will continue to provide 6 MUXs, whereas local relays will only provide 3 MUXs (i.e. half the service). No digital services are available on any of the local relays until the actual switchover date (see the DSO schedule section below), hence a Freeview box obtained in advance will not work. These factors may influence which digital option to choose. The section on Channels & MUXs in the Freeview pages provides more details. Different digital viewing options vary widely depending on what equipment is purchased. The cheapest option will typically be a budget Freeview box, some of which are available for less than £20. However, if a twin tuner PVR Freeview box is required, these can cost up to £200. Satellite receivers are available as either standard definition or high definition units, and with or without a PVR capability. The cheapest way to get going with satellite TV is to purchase a second-hand Sky receiver on Ebay (typically about £40 inc. delivery) and either use an existing satellite dish (especially if there's an unused LNB connection available) or get small dish installed. A high definition, twin tuner, PVR Sky satellite receiver can cost over £400 if it isn't part of a Sky contract / subscription package (i.e. if it's being used for Freesat from Sky). A BT Vision box can be obtained for just a £30 installation fee, by subscribing to BT's broadband internet service (which works for any PC in the house as well as the BT Vision box). The wide variation in the cost of different viewing options (equipment and / or subscriptions) requires some consideration prior to selection. Some High Definition (HD) programmes are available at present, but only on satellite TV services from Sky and Freesat. The intention is (possibly in 2010) to make HD programmes available on Freeview, which will be transmitted in addition to the existing standard definition (SD) programmes. Existing Freeview receivers aren't able to decode any HD programmes, and "HD Ready" TVs are only capable of displaying HD pictures (via an HDMI lead) when connected to an HD satellite receiver, an upscaled or Blu-ray DVD, or an upscaled BT Vision box. The term "HD Ready" is potentially misleading - an "HD Ready" TV that incorporates a Freeview receiver can only display standard definition Freeview pictures right now. After the Freeview HD service begins, it will still only provide standard definition Freeview pictures. Receiving Freeview HD programmes will require a new (and as yet unavailable) Freeview HD receiver with an HDMI connector(and an HDMI lead). The following map shows the 81 terrestrial transmitters that currently transmit Freeview. These transmitters carry the full (6 MUX) Freeview service, and will continue to do so after the digital switchover. Not shown are over 1000 low power local relays, which do not carry any Freeview service until switchover. After switchover, all of these relays will carry just half the Freeview service (3 MUX). Details about programmes corresponding to MUXs is shown on the Channels & MUXs page. The Whitehaven / Copeland region (just to the right of the Isle of Man) is indicated by the shaded red patch, showing the approximate coverage of the digital signal. This was the first region to switch, and completed the digital switchover process on the 14th November 2007. Whitehaven has been used effectively as a "trial" area to sort out any problems with the switchover process before implementing it more widely. Whitehaven was specifically chosen for this for a number of reasons - but essentially this area was "low risk" for things going wrong. 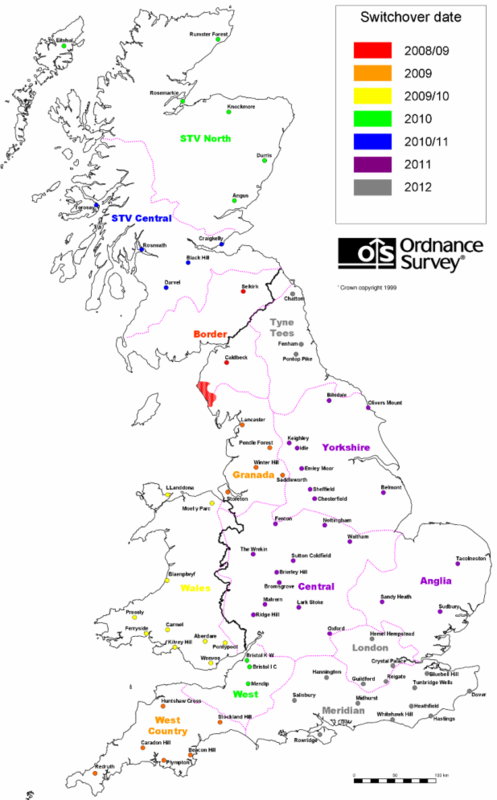 The Westcountry region is shown with orange letters - switchover starts in April 2009 and continues through to Sept 2009. All of the 81 transmitters shown on the map above transmit both the analogue channels and the digital Freeview MUXs currently. Local relay transmitters (not shown on the map above - see the Local Transmitters page) will provide only analogue TV signals until they have been switched over to digital. This makes the plan to "get set for digital" rather more complicated - until some Freeview signals are available, a Freeview receiver won't work. Switching over a relay transmitter to digital transmission requires hardware changes to the equipment at the bottom of the mast, but (mostly) doesn't require any changes to the mast or antenna(s). Many relays will be fitted with transponders that can automatically select analogue or digital format, determined by the signal received from the main transmitter. At switchover, these relays will transmit digital signals as soon as the main transmitter switches. Switching over a main transmitter, however, is much more complicated (judging from local experience with Beacon Hill), and can require major changes to the mast antennas. The Beacon Hill transmitter has had a number of antenna changes made to it - see the Local Transmitters page for more information. Changes like this take a significant time, and so creates a sequence to the switchover process which gradually spreads across the whole of the country, taking several years to complete. Mar 24th 2010 West Bristol I.C. Mar 24th 2010 West Bristol K. W.
The combination of major changes being made to the 81 main transmitters as well as the changes being made to 1040 relay transmitter sites gives some idea of why the switchover process will take so long to complete. The switchover process will happen at each transmitter or relay in turn, hence completing the process for a whole region can take up to six months. 1. Check for digital coverage where you live. The Digital UK website can be used to provide an initial prediction. Local relay transmitters do not carry digital TV programmes until after switchover. In Torbay, Beacon Hill is the only transmitter carrying digital TV currently. 2. Check the service availability. Decide whether Freeview, Freesat, Sky or Cable will be required. With only "half" of the Freeview service available on local relays, the option of a greater selection of programmes offered by satellite or cable might appeal. 3. Get a digibox (Freeview / satellite / cable). 4. Connect it up, switch it on and watch digital TV. Additional SCART leads or other AV leads may be required.